Last Sunday E and I had a fun dinner date with friends. 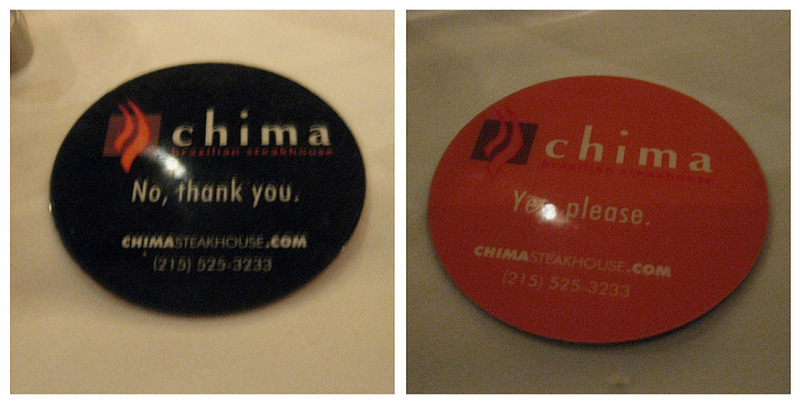 We enjoyed a great meal at Chima Brazillian Steakhouse in Philly. It's a chain, so there may be a location near you. ﻿﻿We celebrated E's birthday last year at Chima, so this was our second visit, but it was a first for our friends. It was Restaurant Week in Philadelphia, so we enjoyed a special lower price for our dinner. The dining style at Chima is unique. Once seated, you are presented with appetizers (Brazillian cheese bread - my favorite, little meatball-like appetizers). You can place your drink order, then head for the huge salad bar. In addition to all types of salad options, there's also soup, beans, and two kinds of rice. You can continue to visit the salad bar throughout your dining experience. Servers walk around the restaurant with huge skewers (more like swords) of meat. If your card is flipped to orange, they stop at your table. You tell them how you like your meat (rare to medium well) and they slice off a piece for you. It only takes about five minutes before you're completely overwhelmed with the selection and you have to flip your card back to the black side. It's so wrong, it's right. ﻿﻿﻿﻿Once the meat starts visiting your table, you also get some starchy hot sides delivered: fried polenta, fried bananas, mashed potatoes, and, for me, more cheese bread! After multiple trips to the salad bar and wayyyy too much meat, there were still some items that hadn't been offered to our table. Our server simply asked us what we wanted (sausage, lamb chops, filet mignon) and within five minutes these meats were offered to our table. Now, you'd think that you would just eat way too much in this situation, but between the huge salad bar and the starchy side options, you really can't eat but so much meat. Still, this is an indulgent, special occasion dining place and I'd only visit once a year. 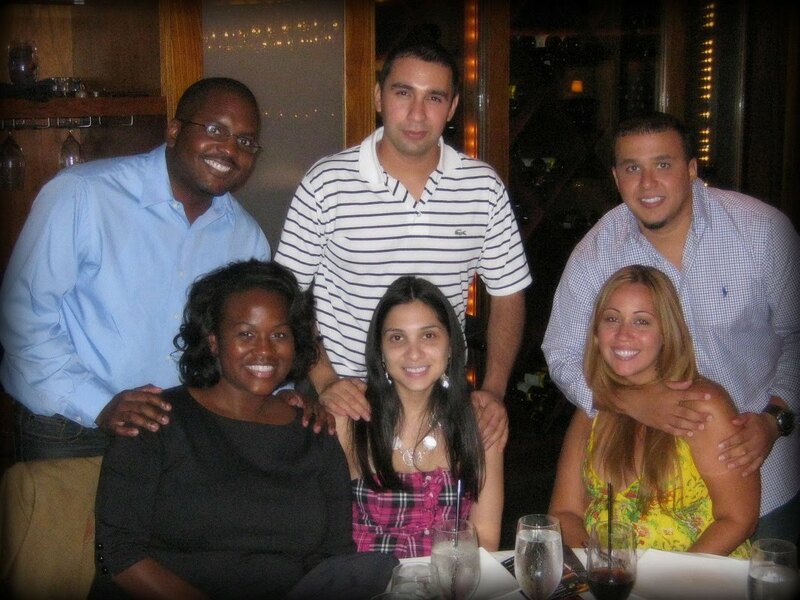 Another great group date! We normally entertain at home, but we decided to take advantage of restaurant week and have a night out on the town. It was well worth it. If there's a Brazillian steakhouse in your neighborhood, consider trying it out. 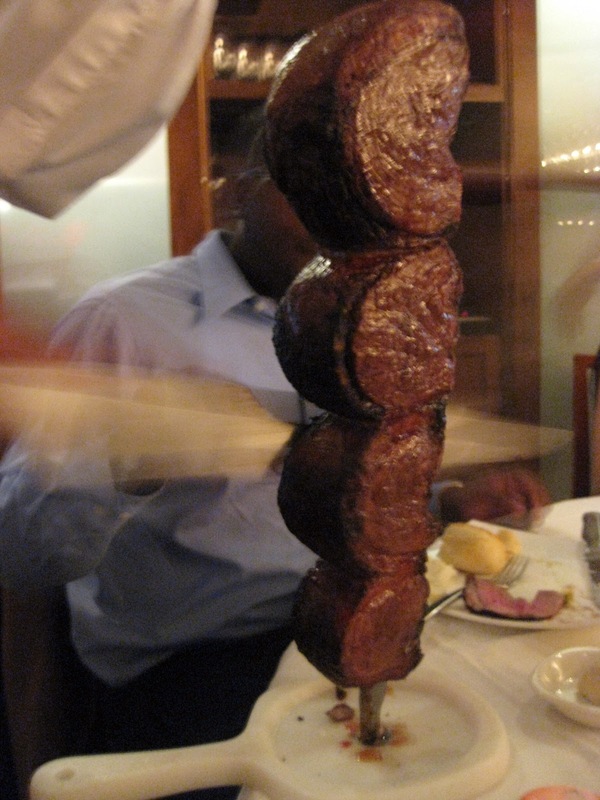 There is one in Tyson's Corner, VA. another spot just like it is Fogo De Chao in B-more. oh how I wish we had a chima's here! Love your interesting blog! oh the memories of my first churassco. you're right, it's definitely a once a year dining experience. but so very worth the calories and trans fats. Sounds like a fun place, kinda like Kobe's. OMG... that is just like Fogo de Chao! I went to one in Chicago for NACADA. What a great dining experience! We were supposed to go for our anniversary, but I got duped into cancelling since someone wanted to watch football...grrr. We went to Mikimoto's and our first date spot instead. I LOVE Chima!!! In my opinion, much better than Fogo for food and ambiance reasons but to each his own. Any Brazillian steakhouse. We actually go about 5 times a year because my husband will pay for a good meal if it is worth it...and Chima is definitely worth it!